President Trump's first full budget proposal lands on lawmakers' desks Tuesday morning. It calls on Congress to spend $4.1 trillion next year, a little more than what is being spent this year. But it would greatly reallocate where many federal funds go -- beefing up spending in some areas, while slashing it in others over the next ten years. Trump is proposing to spend more on defense, border security and infrastructure. And he wants to create a first-ever federal paid family leave program. At the same time, he's calling for drastic cuts to many safety net and other domestic programs that focus on everything from the environment and education to student loans and scientific research. The administration estimates that the president's budget would reduce overall spending by $3.6 trillion over the next 10 years. The end result, on paper anyway, is a fiscal conservative's dream: A balanced budget by 2027 with a reduction in the nation's cumulative debt as a share of the economy. But the White House arrives at those projections in part by using assumptions that few economists or policy experts outside the administration view as realistic. Trump's economic and budget teams assume a higher economic growth rate than others. They also assume that tax reform won't add to deficits and that the controversial House-passed version of Obamacare repeal will be law. Of course, a president's budget is never adopted wholesale by Congress or, in some years, even in parts. But it does lay out for lawmakers where the president's fiscal and legislative priorities lie -- and where they don't -- as they start to craft a budget for next year. The Trump budget would lift the legal spending cap on defense and add $54 billion to its topline funds for 2018. It also would increase funding for defense for every other year in the next decade relative to baseline projections. He is also calling for $2.6 billion to be spent on border security. The bulk of that -- $1.6 billion -- would pay for a "new and replacement" border wall that Trump campaigned on. To offset all the extra defense funding, Trump is proposing to slash nondefense discretionary spending by $54 billion next year and then continue to cut funding by 2% a year for the rest the decade. This category of spending accounts for the smallest part of the federal budget and covers everything from education, legal aid and national parks to government-funded research and diplomacy. Even without Trump's proposal, spending on nondefense discretionary programs is already historically low. As a share of the economy it's at its lowest level since 1998 and is well below where it was 50 years ago, according to data from the Congressional Budget Office. Several programs geared to helping low-income and disabled Americans would come under the knife in Trump's budget. It would reduce spending on programs like food stamps (or SNAP), Social Security disability insurance benefits, additional income for poor seniors, disabled adults and children (SSI), and public assistance for needy families (TANF). Part of the reduction would result from Trump's proposal to tighten eligibility requirements for benefits in these programs and "encourage" work. White House Budget Director Mick Mulvaney put it this way in a briefing with reporters: "If you're on food stamps and able-bodied, we need you to go to work." Mulvaney noted that the Trump plan would require working adults whose low income otherwise qualifies them for the Earned Income Tax Credit and the Child Tax Credit to have a Social Security number. The goal is to prevent illegal workers from claiming them, even if they have children who are American citizens. The administration estimates the change would save $40.4 billion over a decade. Trump proposes to spend $200 billion to encourage $1 trillion in infrastructure investments largely through public-private partnerships. On the campaign trail, two of his advisers proposed providing tax credits to private companies to help repair and modernize public infrastructure. 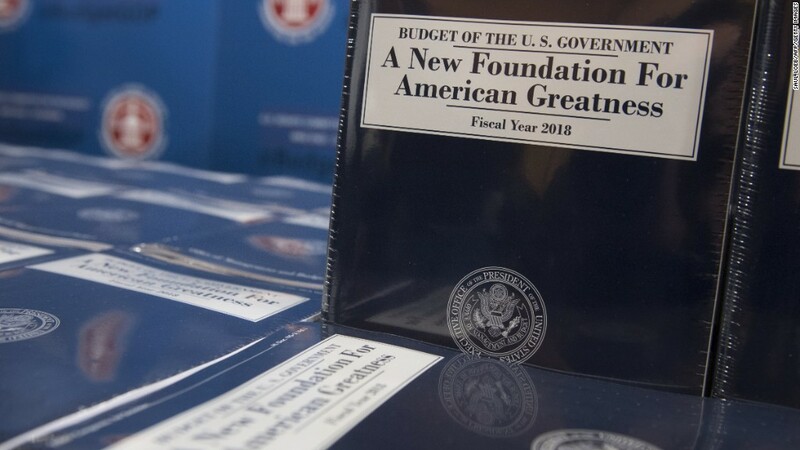 An executive summary of the budget simply says the $1 trillion goal "will be met with a combination of new federal funding, incentivized non-federal funding, and expedited projects." Trump is calling for six weeks of national paid leave to be made available to new mothers and fathers, including those who adopt. The program -- which would cost somewhere between $19 billion and $25 billion over a decade -- would be administered through the unemployment insurance system. Details of the proposal were scant ahead of the budget's release, but it appears to be an expansion of what Trump proposed on the campaign trail. Back then he would have made partial paid leave available only to working mothers whose employers didn't offer paid maternity leave. The budget doesn't propose cutting funding for Medicare or "core" Social Security benefits. But the president's blueprint includes big cuts to federal funding for Medicaid over the decade. That's in large part because it assumes the House-passed bill repealing and replacing Obamacare will stand, even though many expect it to undergo significant changes in the Senate.